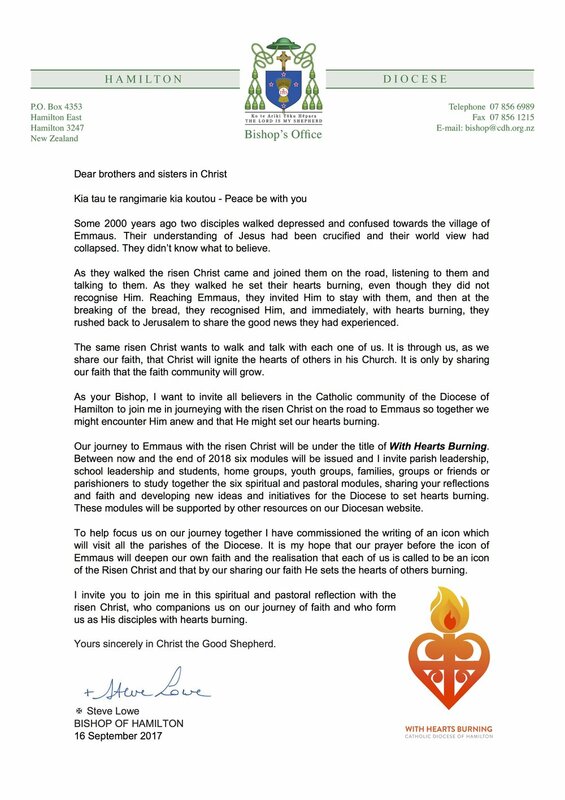 As your Bishop, I want to invite all believers in the Catholic community of the Diocese of Hamilton to join me in journeying with the risen Christ on the road to Emmaus so together we might encounter Him anew and that He might set our hearts burning. Our journey to Emmaus with the risen Christ will be under the title of With Hearts Burning. With Hearts Burning is a 6 part (module) spiritual reflection process for parishes, parish pastoral councils, and all parish and school groups, as well as individuals. As part of the With Hearts Burning Process, groups and individuals were asked to reflect on and answer questions that Bishop Steve posited at the end of each module. The diocesan website collected these reflections and answers. In December 2018 the responses were collated and summarised. Download the summary below.